If you’ve watched the Discovery Channel’s hit TV show Deadliest Catch, you saw the Aleutian Ballad, a commercial fishing boat, escape a rogue wave in the Bering Sea. 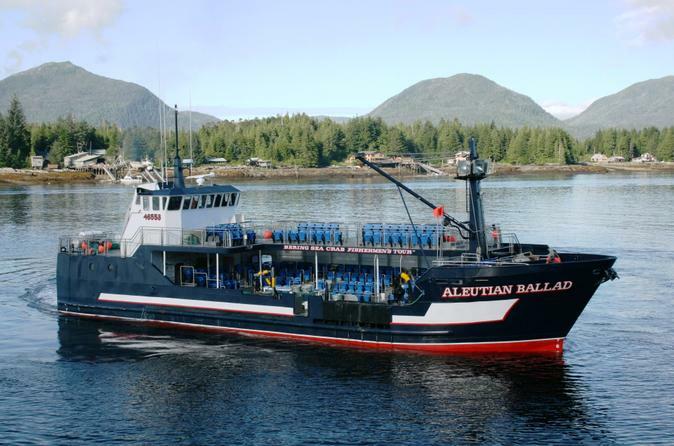 On this 3-hour fisherman’s shore excursion from Ketchikan, the Aleutian Ballad’s seasoned fishing crew takes you through the tranquil, protected waterways of the Inside Passage. Stare in wonder at the variety of marine creatures caught in barrel pots and hauled up on deck. Touch some of the catch, take photos and listen to entertaining sea lore. Discover what life is like as a commercial fisherman in Alaska on this 3-hour Bering Sea fisherman's shore excursion from Ketchikan. 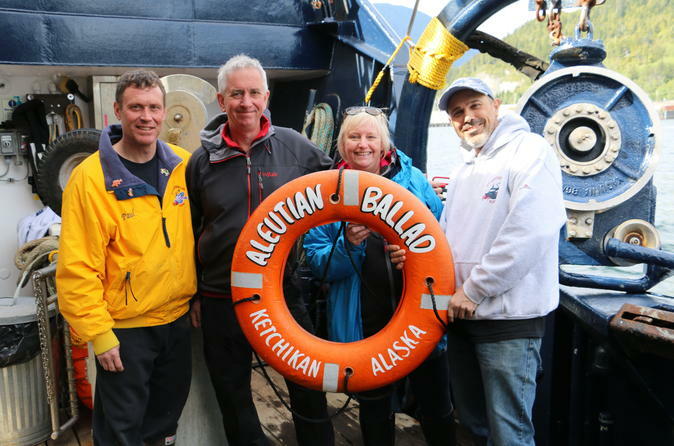 Meet the crew of the Aleutian Ballad and step aboard their 107-foot (33-meter) ocean-going vessel. Admire the views from the open-air upper deck, or take a seat in the heated, enclosed amphitheater on the lower deck. Your crew will ‘tie loose,’ push away from the dock and cruise through the waterways of the Inside Passage. Savor a cup of provided hot chocolate, coffee or tea, and hear about the Aleutian Ballad’s history as a commercial fishing boat, including how it became famous on season two of Deadliest Catch, when the boat was struck by a 60-foot (18-meter) swell and survived to tell the tale. Ask them questions — the crew enjoys sharing stories about life at sea! During your outing, keep your eyes peeled for eagles, sea lions, whales and porpoises. When you reach the fishing grounds, see up-close how the crew bait the fishing gear with salmon and squid and toss the long-line barrel pots overboard. Then, marvel as the crew pulls up Bering Sea king crab in 700-pound (320-kg) crab pots. Other sea creatures hauled on board include Dungeness crab, rockfish, ratfish, wolf eel, box crab, octopus, gray cod, prawn and more. The crew sorts through the catch, and places the fish and other marine life in a tank on the deck for your observation. Feel free to snap pictures and touch some of the catch before it is released back into the sea. Set voyage back to the dock after the crew has stowed all the fishing equipment. We will ensure your excursion ends with ample time for you to return to the Ketchikan port for your ship’s departure. In the extremely unlikely event your ship has departed, we will arrange for transportation to the next port-of-call. If your ship is delayed and you are unable to attend this activity, your money will be refunded. See our terms and conditions for full details.